After the measure phase, during which a custom element calls the Measure method on each of its child elements, each child element will set its DesiredSize property to indicate how much space it wants. 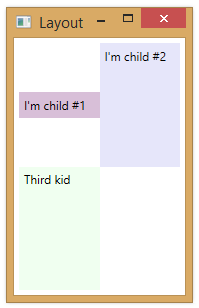 The DesiredSize of a child element accounts for any margins that have been set on that child. 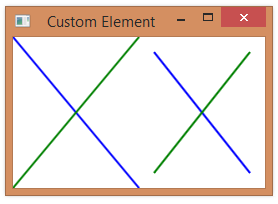 Assume that we have the following XAML (MyElement is a custom element with a single child). We can see that the child element uses a margin. We can look at the value of the DesiredSize property after Measure has been called on the child element. We can see that in the second case, the desired size is larger, indicating that the child wants to add a margin. During the measure phase, the MeasureOverride method is called on an element, indicating the size available to the control. If a Margin has been set on the control, the available size passed in to MeasureOverride will have already been adjusted for that margin. Below, we include two instances of MyElement in a Grid, setting a margin of 15 on the second element. At run-time, we see that the second element is smaller. 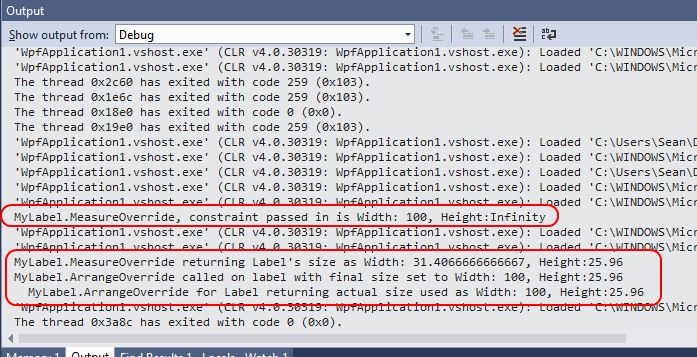 If we instrument MyElement to report the value of the Size parameter that is passed to it, we see that MeasureOverride gets a smaller size passed in for the second instance. The Size has been adjusted for a uniform margin of 15, subtracting 30 from both the width and the height. (We see the same values passed in to ArrangeOverride). 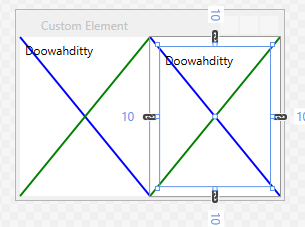 When creating a custom panel and overriding the measure and arrange methods, your custom panel can make use of a child element’s DesiredSize property when deciding what size to make each child and where to arrange them. 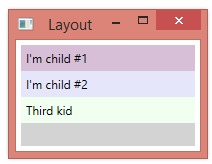 The code below arranges child elements vertically, like a vertical StackPanel, stretching each child to fit the panel’s full width, but using each child element’s DesiredSize.Height. 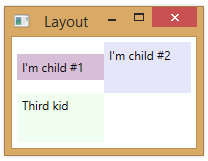 Below is a very simple example–a panel that does nothing in either its MeasureOverride or ArrangeOverride methods. We’ll build on this class in future posts. 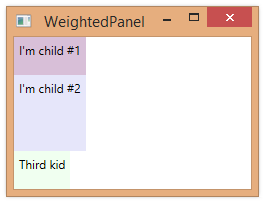 If we add children to this panel, they will not be displayed. 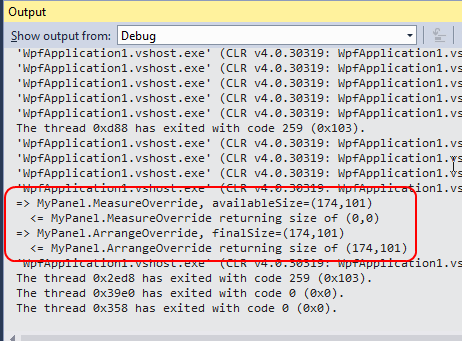 Below is debug output at run-time. MeasureOverride returns (0,0) because we haven’t calculated any sizes. When a panel is laying out its children, it will respect (make use of) an explicit size specified for a child control. In the example below, the MyLabel control specifies a width of 100. This makes it wider than it would normally be to fit its content.